The world is changing and video-consumption is at an all-time high. People are demanding more and more visual content, and brands need to start creating videos at scale to fulfill their consumer’s needs and increase their ROI. YouTube reports that video consumption is increasing 100% every year, and videos have started to replace all other forms of content in the digital world. Video-first is no longer just a buzzword; it’s a multi-billion dollar industry that’s taking over the digital world. So, whether you’re bringing large-scale video production in-house or simply creating short YouTube videos for your brand, what’s the first step to creating high-converting video content for your consumers and employees? You can hardly shoot a video without one. But most people, especially ones starting out, get stumped when they’re trying to decide which video camera to purchase. It requires an insane amount of research, spending hours in the Amazon rabbit hole reading reviews after reviews, and watching a plethora of YouTube videos comparing different models. I’ll be the first to admit, it’s a little … taxing. To make this process infinitely easier for you, I researched (and researched and researched) and came up with the best of the very best video cameras for all budgets. So whether you’re strapped for cash, can fork out up to $500, or can go up to $1000, there’s something for all. Don’t just depend on my review, do a bit of research yourself on the cameras mentioned below, and choose one that works best for you. Different types of video cameras - what’s best for your shoot? If you’re new to the world of video camera's, you might get confused by the multiple camera types available. Don’t be. Smartphones have a good quality inbuilt video camera and can easily be used to shoot vlogs and high definition videos. Larger in size, DSLR cameras (which stands for digital single lens reflex camera) are one of the most popular digital video cameras out there. Their interchangeable lenses, optical viewfinder, a wide range of prices and types, pro image quality, and versatility are some of the many reasons why most people opt for this camera type. Smaller and lighter than a DSLR and without the optical viewfinder and mirror, mirrorless cameras have an advanced sensor to capture epic quality video. Their pros include autofocus system, small size, and interchangeable lenses. While a bit more expensive than DSLRs, they’re a foolproof option for video enthusiasts. Remember a time when people used simple cameras to capture an image. Point and shoot cameras are best for beginners who’re looking for cheaper, smaller video cameras and not interested in all the fancy bells and whistles. No high-tech features, no lenses, no fancy viewfinders, yet also no compromise on the video quality. Old-school giant video cameras we’ve all seen at our house. While the overall video quality of camcorders cannot compare to other cameras I’ve discussed above, it’s price, flexibility and user-friendliness appeals to several people. Now, let’s discuss what video cameras fall within your budget. Your smartphone camera is the best option for you if you’re strapped for cash. I used my iPhone 4s for the longest time to shoot videos. Granted they were simple family videos, but they turned out pretty well. And the latest smartphones sometimes rival professional cameras. So you’re in good hands. While smartphones are not for professionals who’re into filmmaking, beginners looking to shoot YouTube videos and vlogs, they should work just fine. And with a plethora of editing and video apps available, smartphone users can easily amp up the quality of their videos. You’ll find this camera in almost every best video camera list. Because it simply is one of the best entry-level DSLR out there. It’s lightweight body, long battery life, excellent image quality and superior auto-focus performance make it a must-buy for aspiring videographers, vloggers, and marketers beginning to produce video in-house. One of the best mirrorless video cameras out there that users cannot stop raving about. Quick auto-focus, great image quality, lightweight and the excellent price is amongst some of its many pros. The learning curve is negligible, os it’s a great buy for people afraid of the many technicalities DSLRs come with and still want to shoot great quality videos. 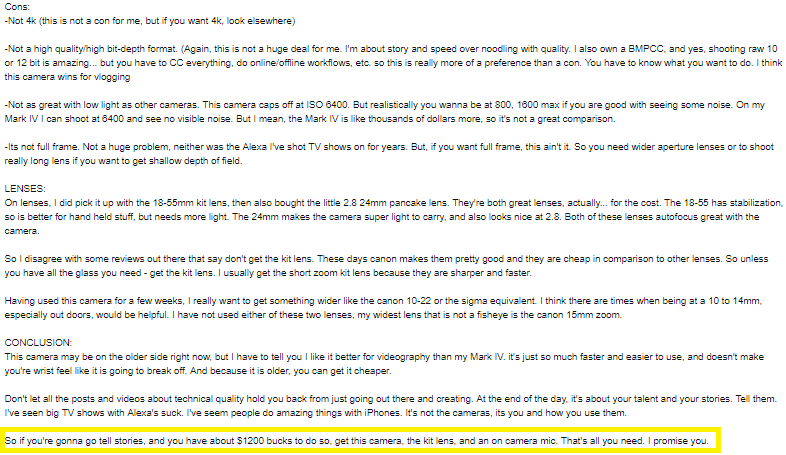 This was the review that sold me to Canon EOS 70D. And let me tell you, I’ve never looked back. It’s still one of my best and favorite purchases. Whether you’re a beginner or have been around the block, this DSLR is perfect for everyone. You can buy it without a second thought. If you’re looking to shoot 4k videos but don’t have 4k budget, then this mirrorless DSLR-style camera is perfect for you. It’s lightweight and small, has time-lapse option on dial, is excellent in low-light situations, has customizable features which include in-camera highlight and shadow (saves a ton of time and headache in post-production process), and overall a pretty great option for everyone looking to produce stellar video content. The best of the very best: What cameras do YouTubers use in 2018? YouTuber’s are the ultimate video creators. After all, their bread and butter is making videos that hook viewers in and connect with them. They make engaging video content regularly, have incredibly loyal audiences, and know how to strike the right balance between video content quality and quantity. In short, they're great examples to emulate when you’re starting to create video content, especially where video gear is concerned. Vlogger put together a couple of video cameras used by popular YouTubers and video influencers, so if you’re on the hunt for the best of the very best video cameras, look no further. For only $699, Canon Powershot G7 X is a powerhouse in the video camera industry. We’ve already talked about Canon EOS 70D in our mid-level video camera range, and for good reason. It’s a favorite amongst popular YouTubers and an amazing investment for the price it’s at. Canon’s 80D is a slighter better version of the cult-favorite Canon 70D. You can create amazing videos without having to sell your soul or give away all your life savings. Your video content depends more on your video and storytelling skills than the newest Canon DSLR. So start small and buy a camera you’re comfortable with. As your brand grows and you scale up your video content, you can invest in better video equipment. So just buy a camera and start shooting!